Pretty good car for short trips. No major complaints, but I do wish it had power windows. Mine is an automatic, and seems like it should have another, higher gear - at normal highway speeds, the engine sounds like it is near red-line even with the 4 piston engine. . The fold down rear seat makes the vehicle more useful than might be expected for such a small car (hatchback model). The only problem was one of the shock absorbers coming loose and causing the tire to lean into the wheel-well. I was able to fix it myself by replacing a bolt. In Virginia we have annual safety inspections, and one year the vehicle failed due to a tie rod coming loose and needing to be replaced. -- $900. 00 for that and other minor issues. The car is 18 years old - if I keep it another two years, it can be registered as an antique, no longer requiring annual inspection or personal property tax. Yes, in Virginia we pay tax on vehicles every year. One radio knob fell off, but I can live with that, as the control still works. The fan speed control for the heater and a/c lost it is click-stops and now is either on full or off, no in between. Some oil usage, and if the car is started after being allowed to sit for an extended period a large cloud of gray smoke is produced, but clears after the engine has run a few minutes. Surprisingly good for long trips. My metro's top feature, for me, is its gas mileage. Combined, it is in the neighborhood of 30-36 miles per gallon, even despite being over 18 years old. It is a really nice thing about the car, especially with gas prices today fluctuating all the time. $20 Is good to last most of the month. The comfort levels are modestly good, even on long car rides (8+ hours or more, I have driven my car on a ~19 hour round trip Journey in one day), though due to its size, it will be even more comfortable for shorter drivers and passengers. It only has three cup holders, but this is sufficient for most cases. The ride is nice and smooth, and while not powerful, the car has enough power to take traffic-packed Denver interstates. Worth it for mint condition. Honestly I like this vehicle but it is getting very old obviously. If you can find one in mint condition it is worth it as they are fun to drive. I would keep mine forever if I could. I recommend this vehicle to any Chevy fans who love outdated vehicles. Take care of this car and it’ll due to you the same. 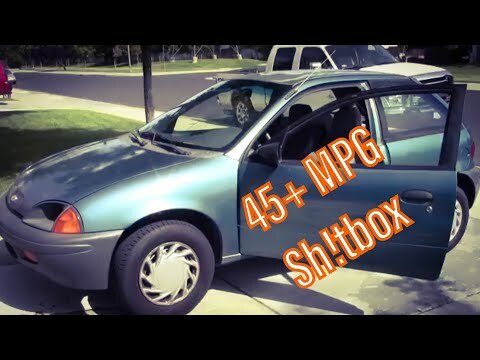 GEO METRO REVIEW | It drifts, it floats and it flies!